Since the time of pre-history, carpetmakers tie intricate knots to form carpets for the court of the Emperor. These carpets are made from the hairs of wives and daughters; they are so detailed and fragile that each carpetmaker finishes only one single carpet in his entire lifetime. This art descends from father to son, since the beginning of time itself. [widgets_on_pages id=”Science-Fiction & Fantasy World Tour”]In the foreword of The Carpet Makers, Orson Scott Card tells us how he attended a science-fiction convention in France where all everyone would talk about was the new German author Andreas Eschbach. Unfortunately, his books weren’t available in English, so Card returned home with a short story, actually the first chapter of The Carpet Makers, and asked a friend to translate it for him: “The result was a story that blew [him] away”. Later, Orson Scott Card managed to introduce the book to Tor publishing and got his friend Doryl Jensen to translate the rest of it. The Carpet Makers is truly unique. The story is brilliant, but what shines even more is its insights on politics, cult of personality and the impact of revolution on culture. Yet, what really stroke me as pure genius in this novel is its very particular structure. I can honestly say I’ve never read anything like this before and it really makes The Carpet Makers a masterpiece of literature. The Carpet Makers‘ story doesn’t progress in a traditional way: the narration keeps changing point of view and the reader feels like a little wisp feeding on people’s thoughts and feelings, changing target as he learns everything he can. The focus of this exploration is a pan-galactic Empire, its customs and culture, and a great mystery about the production of human-hair carpets, a life-long and painstaking task undertaken by its subjects. Each chapter is based on a new character and how he relates to the Empire: his (imposed or not) role in society and his faith (or lack of) in the Emperor. One of my favourite story is about a boy who was enlisted as an Empire shipman. What he wants, though, is to become a musician so he takes refuge in his music teacher’s home. However, his defection exposes both men to the risk of the death penalty. 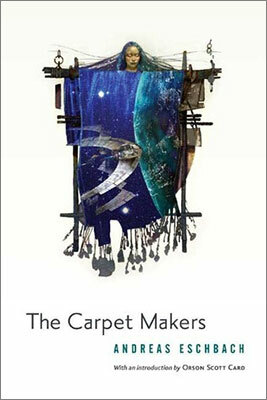 The Carpet Makers really is a book about people and their relation to power, politics, religion and everyday needs, as they all conflict with each other. As a result, almost every single chapter works perfectly as a short story. This is really remarkable and gives a lot of depth to the book, as you explore every part of this huge organism that is the Empire. Thus, the progression of the book is not chronological or led by a single main character. It’s more thematic: each chapter is an exploration of new elements revealed in the previous one. It follows a trail from character to character and place to place, starting from an incident on a nondescript planet to finally shed light on a universe-wide tragedy. Absolutely riveting and epic. I also love The Carpet Makers insights on social issues. It first shows the danger of mingling politics and religion, and especially of the cult of personality. Extreme fear and faith blind people’s best judgement and lock them into a dark age of obscurantism, in which their belief justifies hurting each other. Even better, Andreas Eschbach also explores the other side of the coin: the damage of violent, hatred-driven revolution. He especially shows how the misplaced zeal of rebels, eager to reject everything from the previous government, can lead to a dramatic loss of knowledge, history and stability. Only power promised fulfillment in life, and I have pursued it — long enough to recognize that it’s a false promise and that this road leads to nothing. To conclude, I can’t recommend The Carpet Makers enough. It’s a thought-provoking, epic science-fiction novel about a several-thousand-years-old universe-wide Empire through its people. The structure of the book is remarkable, very unique and makes the book “unputdownable”, a word I had sworn I would never use (sorry!). Since I said it, let me add that it is an absolute must-read!